We live in times of overexposure and desire to be in the spotlight, even if it’s for a mere five seconds, but I am much more interested in people with lasting talents and substance, who don’t crave spotlight, yet deserve it in spades. Those who have supreme talent and self-assurance, who work hard and prefer the fruits of their labour to speak for themselves – and skincare specialist Vaishaly Patel is one of those people. I first visited Vaishaly at her Paddington clinic quite a few years ago and always loved the charming atmosphere. Serene, peaceful, with the always smiling staff and Vaishaly with her grace, perfect skin ( I can’t help it to this day and look at the skin of the people who work in health & beauty industry ) and gentle hands, which beautified your face and tidied your eye brows. She nurtured many talents in her clinic, including Nonnie Creme, founder of the very popular Butter London brand, who did rock-chic manicures and pedicures and added a cool vibe to the atmosphere. The clinic is much bigger now, yet the atmosphere is as happy, serene and discreet as many years ago ( Vaishaly has many clients who are well-known personalities, yet you would never hear her indulge in any gossip or discussion on who she treats ). 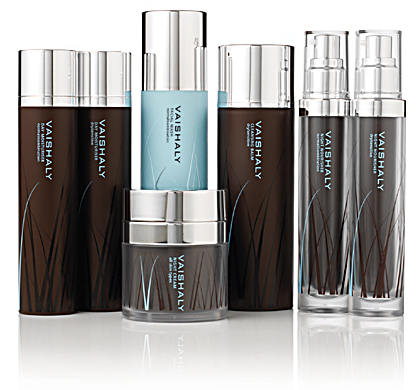 Vaishaly was one of the first facialists who thought about creating her own skincare line and after trying and perfecting things, she launched her tightly edited products which are now used in select Spas around the world and hotels like Four Seasons and The Dorchester. Hers are the skincare products that will actually deliver results and make you feel truly pampered day and night, if you can’t pop in to see Vaishaly or one of her skillfully trained facial therapists in the clinic. Choose, depending on your skin type and needs, via the helpful guide on Vaishaly’s website, from a Facial wash, Cleansing Balm ( one of my timeless favourites ), Anti-Ageing Day Moisturiser ( there is also one with added SPF 15 ), Anti-Ageing Night Cream and Night Nourisher ( a heavenly product, especially when autumn and winter arrive on the doorstep ). Facial Wash ( for normal/combination skin ): this pinky red gel-like formula is a gently effective treat for your skin and the senses. Apply a couple of pumps of the gel to your face, massage it all over, focussing on your jaw line, then add a little bit of water and massage further ( use Vaishaly’s massage technique, explained in the leaflet accompanying each of her products ) all over again to reveal a brighter, softer and plumper complexion. The anti-bacterial formula ( with lemon myrtle that is known for its purifying properties ) also hydrates ( and heals the skin with aloe vera ) and I love using it in the morning, before layering the serum, moisturiser and sun protection on top. This SLS free cleanser is sugar-based and was formulated to remove impurities that can clog our pores and remove excess oil, if you are prone to it, as well as reduce the inflammation in your skin. The facial wash also has a subtle, unique smell that energises & relaxes your mind at the same time. INGREDIENTS: Aqua (Water), Aloe Barbadensis Leaf Juice*, Coco Glucoside, Glycerin, Cocamidopropyl Betaine, Sucrose Laurate, Ethanol, Algin, Xanthan Gum, Panthenol, Phenoxyethanol, Carrageenan, Sodium Hydroxymethylglycinate, Backhousia Citriodora (Myrtle) Oil, Citrus Medica Limonum (Lemon) Peel Oil*, Citrus Aurantifolia (Lime) Oil*, Mentha Piperita (Peppermint) Oil*, Citral, Limonene, Potassium Sorbate, Citric Acid. Cleansing Balm ( for dry/sensitive skin ): this aromatic balm feels truly luxurious when you use it in the evening, after a busy day in the city full of grime and pollution. Apply it to the tips of your fingers, massage it between them for a second of two, to release its aroma and then apply it all over your face, massaging it thoroughly, boosting your blood circulation and making sure that every part of your face benefits from this dreamy formula that emulsifies when you mix it with water-and there is no need to use a face cloth with this balm. Formulated with sweet almond and olive oils that cleanse and nourish your skin, as well as arnica, ginko and calendula complex that will reduce irritation and redness, while arctic oat seed lipid will sooth and alleviate your skin, if its prone to dryness. With an added antioxidant protection from Vitamin E you will go to bed knowing that your face will be thoroughly clean and skin will be effectively regenerating, as you sleep, hopefully for at least seven un-interrupted hours – well, one can dream of it and aim to achieve it at least once in a while ( that’s the interesting thing about age & sleep – when we can, we don’t take advantage of it and when we want to, we can’t ). Balm-like formulas are becoming more and more popular, especially during the times when the weather is too hot or cold and it makes me smile thinking that this product was created many years ago, when we had much less choice of the type of cleansers on the retailers shelves, yet some products are not touched by the passage of times, proving the talent and the vision of the person who creates them, making sure it’s as perfect as can be from the beginning. INGREDIENTS : Prunus Amygdalus Dulcis (Sweet Almond) Oil*, Olea Europaea (Olive) Fruit Oil*, Glyceryl Cocoate, Cera Alba (Beeswax)*, Carthamus Tinctorius (Safflower) Seed Oil*, Avena Sativa Seed Extract*, Cananga Odorata (Ylang Ylang) Flower Oil*, Lavandula Angustifolia (Lavender) Oil*, Pelargonium Graveolens (Geranium) Flower Oil*, Rosa Damascena Flower Oil, Anthemis Nobilis (Chamomile) Flower Oil*, Citral, Eugenol, Geraniol, Citronellol, Farnesol, Linalool, Benzyl Alcohol, Benzyl Salicylate, Isoeugenol, Benzyl Benzoate, Limonene, Arnica Montana Flower Extract*, Ginkgo Biloba Leaf Extract*, Calendula Officinalis Flower Extract*, Tocopherol. Anti-Ageing Night Cream: from your late 20s the ageing process slowly starts to affect your skin, so it’s a good idea to start your age-proofing by adding effective skincare products to protect and nourish your skin, thus making sure your look your best at every stage of your life. This light-weight night cream smells of jasmine and sinks into your skin as soon as you gently tap it on. Vaishaly developed the cream to help repair and replenish the skin with a natural oligopeptide that will help reduce the appearance of lines and wrinkles, while organic beech tree bud extract will moisturise and shield your skin from free radical damage. There are also the added benefits of macadamia oil and soybean that help to strengthen the skin matrix, while arnica, ginko and calendula complex will help to reduce irritation and redness, particularly when more and more women start developing rosacea, the reason for which currently can’t be exactly defined. I also think that Vaishaly was ahead of her time not just with the packaging – each product is comfortable to hold in your hand, airless pumps for cleansers and the pump-top night cream, that releases just the right amount of cream to use at a time. Vaishaly was also one of the first British skincare specialist to look into organic ingredients and incorporate them into her products ( one of Vaishaly’s top-selling products, the sublime Night Nourisher, has been out of stock for months now, due to ingredient sourcing, yet Vaishaly isn’t the one to cut corners and has been patiently reassuring her loyal customers that it will hopefully be back in stock later this year ). When it comes to Vaishaly’s skincare products, you can safely rely on the knowledge that her formulas are effective & there is no oxidation or mess with the packaging. There is just naturally beautiful skincare to address your needs and make your beauty routine simple, without compromising on ethics or quality.